the family Moraceae includes about 70 genera and one thousand species: it is about trees or about shrubs most often tropical, producing the latex, alternate leaves, simple, entire or more or less lobbed. 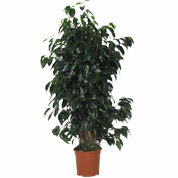 The genus Ficus includes 800 species. 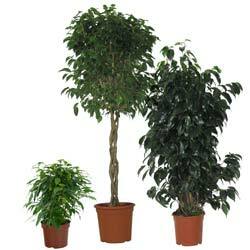 Rubber, common noun of the Ficus elastica. Flat shrub native to India. Broad leaves, of 20 cm, glazed, coriaceous, dark green top. Beware: the Rubber is slightly toxic because of its sap, a latex irritating that you should not hit in the mouth. Its leaves are small, of 5 cm, pointed, smooth margin. They go yellow not according to seasons, but of watering defect. Plans are however influenced by seasons, because their growth is decelerated in winter (days are shorter). 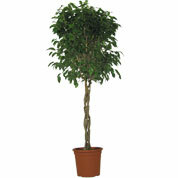 Beware: Ficus benjamina liberates dust rich in allergens that can trigger persons allergic to nasopharyngitis, conjunctivitis or asthma attacks. Refer to Advices of maintenance. 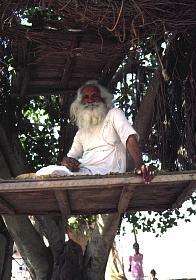 Indian Fig tree or Pippal or Tree of Buddha, Ficus religiosa, because Çakiaumuni received illumination, sitting under this tree in Bodh Gaya, state of the Bihar, in India (photo taken in India). Its leaf is broad, petiolate, stringed at the base, and acuminate. Banian, F. indica or F. bengalensis (photo taken in Malawi), also called "multiplying ", because it takes root since branches, or "strangler", because it can develop from a seed left by a bird on another tree, because it envelops its roots and eventually strangle. Its ability to live in the air, without taking into the ground, is called "epiphytic". The banian can have more than 350 big trunks and 3 000 offshoots. Record is held by a banian of Calcutta (India), which measures 412 m of circumference. Sycomore, F. sycomorus: well-known to Egyptians who made dignitaries' coffins. Not to confuse sycomore with the maple (the lobbed leaf of which resembles that of the fig sycomore). 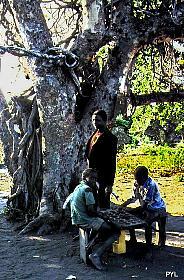 For the Americans, the sycomore is the Plane tree, which plane tree has leaves well lobbed, which make think of those of the maple of sycomore. To curl and to complicate things, the Latin name of this maple is "Pseudoplatanus", "false plane tree" ! In Egyptian mythology, the Sycomore is the lucky tree of GODDESS HATHOR, goddess at head of cow, girl of Nout and of Rê, also the only goddess represented by face.